Food trucks scheduled to appear include Auntie Vee’s, Grill Chasers, Mario’s Cart, Chicago Pizza Boss, Toasty Cheese, Best Truckin’ BBQ, and Crave. Water and soft drink beverages will also be available for purchase on site at the event. Parking between the Family Aquatic Center lot and the amphitheater will be reserved for handicap parking only. Free parking is available in the Community Center lot off of Wood Street. A path between the Community Park baseball fields will take attendees directly to the event. 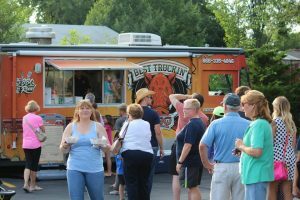 The fourth annual Food Truck Frenzy gold sponsors include AMITA Health, Best Brains of Palatine, Consumers Credit Union, Costco Wholesale, Daily Herald Media Group, Epic Urgent & Family Care, MB Financial Bank, Orthodontic Experts Ltd, Palatine Bank & Trust, and SportClips Haircuts. Several sponsors will be on site with giveaways and raffles. The Palatine Park District Sounds of Summer Concert Series main stage performance is presented by Andigo. Morry Sochat and the Special 20’s are a Chicago based band specializing in Chicago blues, west coast swing, and 50’s rock n’ roll. They are a five-piece standard Chicago blues band with harmonica, guitar, piano, drums, and bass. The 20’s studied the early Blues and the great players, including Muddy Waters, Little Walter, Big Walter, Junior Wells, Otis Span, Howlin’ Wolf, and George Smith. For more information about Food Truck Frenzy, contact Special Interest Coordinator Lisa Schroeder at 847.496.6347 or lschroeder@palatineparks.org. For more information about the concert, contact Cultural Arts Coordinator Ashley Schiavone at 847.496.6237 or aschiavone@palatineparks.org.